DG is the popular abbreviation for 'Dave's Garden', my favourite website [DG]. I've told how I got into it in the earliest posts of this blog in 'My Gardening Story' [is in three parts]. I had also briefly mentioned about an important activity among the members, called 'Seed Trading'. People post up their 'have' and 'want' lists of seeds/plants in their 'pages'. Those who 'want' will choose from the 'have' list and there is an exchange. I realized the value of carefully collecting and saving seeds from the plants only when I understood this activity of seed trading. Some people go beyond and commercialize this activity. 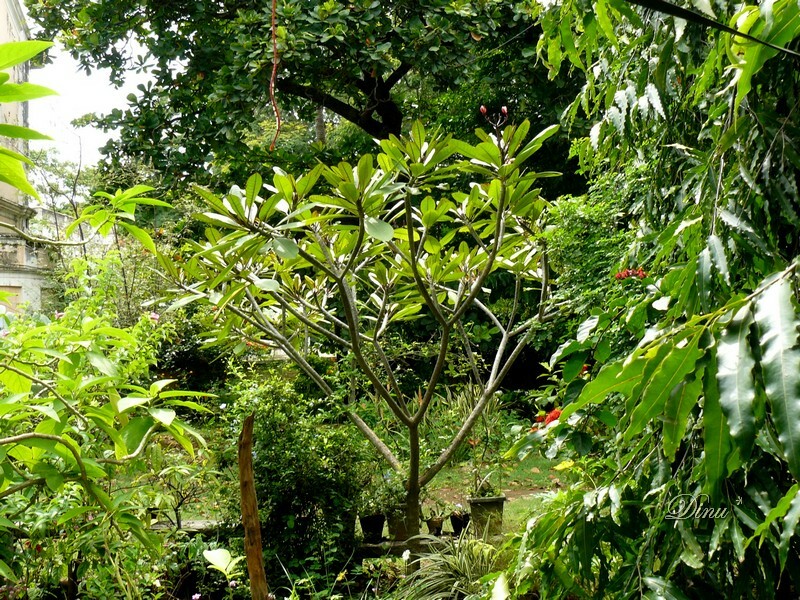 The profits they get is utilized for further improvement of their gardens! My first 'trade' was in 2002, with a young, very bright boy of 14 in Finland. Later, there were trades with 30-40 gardeners mostly in the USA and hundreds of varieties of seeds. I was humbled by their generosity. The tragedy is that 95% of the seeds failed to germinate in our tropics. So I went slow on that later. To give away in exchange, all I was having was the Clitoria Double Blue to start with. Quantity was not the matter with many of them. Often one way trading from either side took place with equal enthusiasm. The intention and motto was to 'spread the seeds far and wide'! We just sent what we had if someone asked but did not need anything in return. Here I am sharing a few pictures only of flowers on plants that are still growing from traded seeds that have reseeded well. Most are from fellow gardeners in the US. They have adjusted nicely to the conditions of Mysore and I must add 'survive my neglect' [to some extent]. So, they are 'hardy' here! 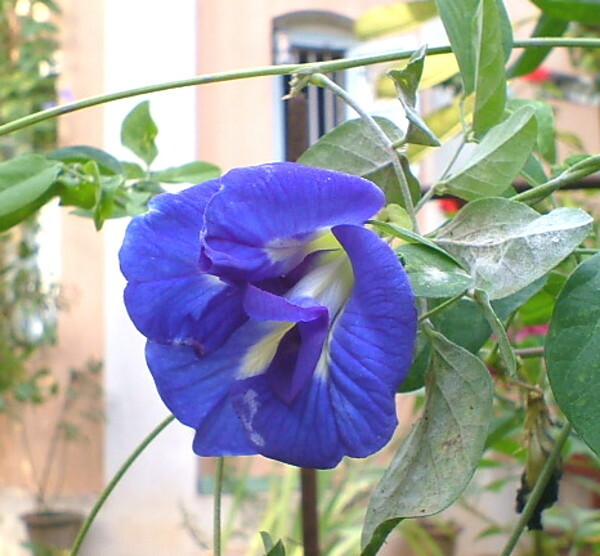 My clitoria seeds were very popular. Many gardeners asked for seeds and got them. I have sent them out with great delight. Its first seed was given to me by our neighbour in 1999 or so. I found out from my diary that this Gladiolus callianthus [syn. Acidenthera bicolour] was sent in 2003 by Evert, that boy from Finland. I cherish it because of it. Many of the senders of seeds were American lady gardeners. Here are two sent by MaVie Rose in 2002. A moonflower. It opens in the evening and stays open in the night. Large flower. She also sent me seeds of Datura triple yellow. Note the triple layers of petals. 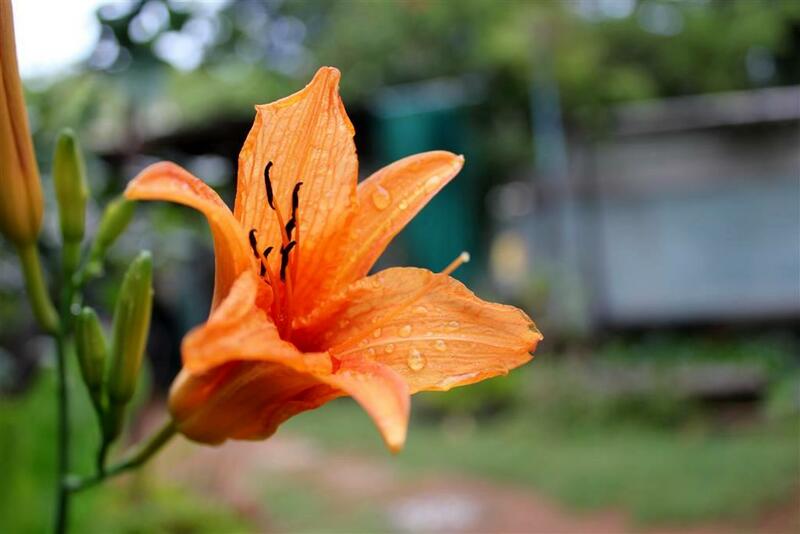 It reseeds freely and blooms nicely even after 10 years and many generations of seeds. Large flower. 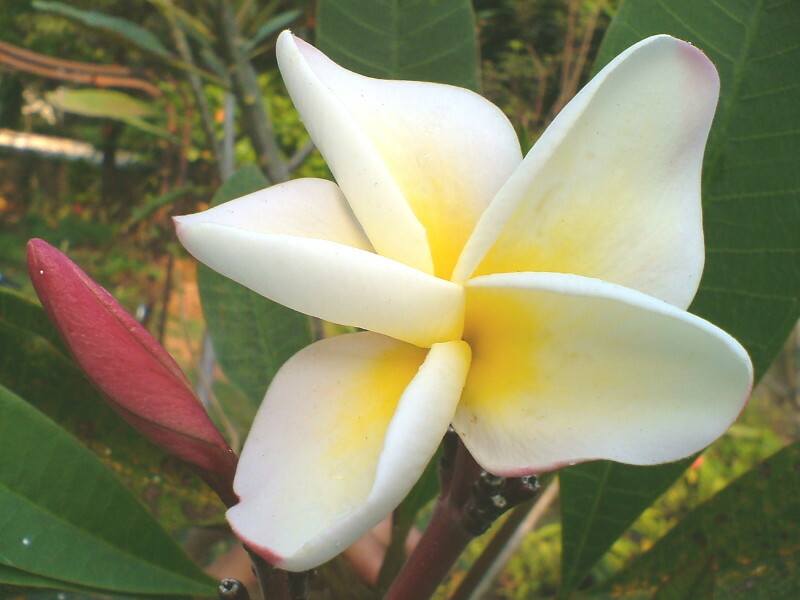 and two different Plumeria seeds. I did not know Plumerias grew from seed also! They germinated nicely and grew and had become a little tree in 5 years. I brought both their cuttings to my new yard where they are doing well. Nice blooms. It appears that whoever grows from seed will have a new 'cultivar' and that we can give an exclusive name to it!! Because it is pollinated using another variety. I think Larry had done it for fun. I found this interesting! This is another 'cultivar' I grew from seed from Larry. Picture of the tree in my old yard. Mary Davidson ['busybee']'s Cypress Vine and Scarlet O'Hara are doing so well that it is hard to control them from spreading volunteer seeds all over! This is the Scarlet O'Hara - lovely morning glory. 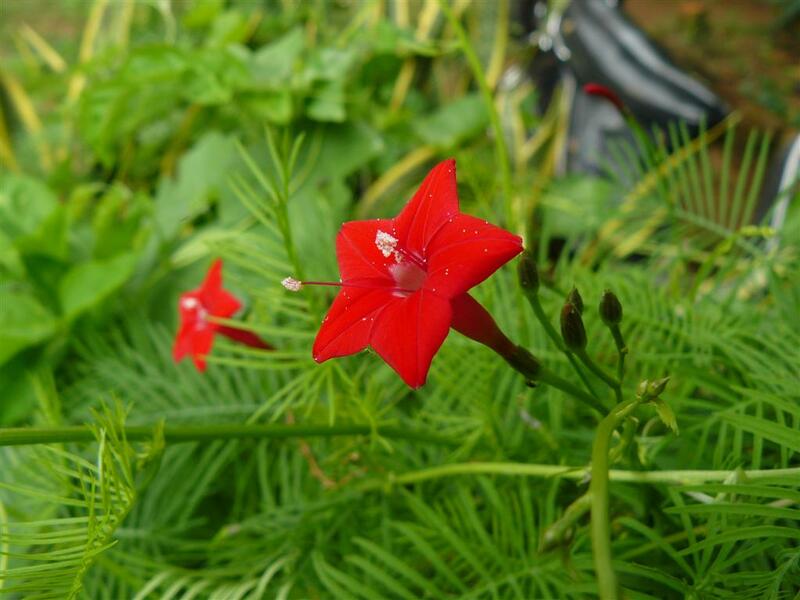 This is the Cypress vine [also called Cardinal climber]. The red blows us out, though small. One 'elgringo' who happened to be one Charles DeFrance, sent me a small portion of this cactus. A carrion plant. Its smell is horrible. Hence 'carrion'. Large flower that lasts a day. A certain Kit Pitman who was 'windsurffer' had sent a few tiny globular black seeds of this 'Tall Red Canna'. It is doing very well and the colour is stunning. DG was again instrumental in being the common platform for bringing me and one Jassy from a place what is renown as a 'steel city' - Jamshedpur, in our own country. She is another very enthusiastic gardener. She was kind to send me a 'day lily' bulb Hemerocallis fulva. It is a beautiful flower. Lady Anne appeared to be a very organized gardener when I saw the labels on seed packets she had made. This is the [Morning Glory] Grandpa Otts, now nicely up on my garden arch and reached to read my favourite quote by Sir George Bernard Shaw. There were many that bloomed and did not survive for the next season. Some did germinate, but did not grow up, some could not tolerate the rain and the heat and as I said many did not germinate at all. In another post, I will show the ones that got to bloom once and will also show how they came in nice little labeled packets. Packing seeds seems to be an art in itself!